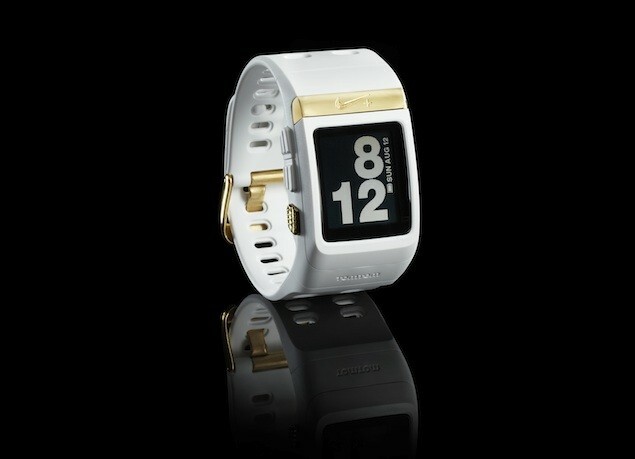 Nike has been getting into the Olympic spirit as much as the rest of the globe over the past fortnight and has unveiled a special edition, gold-plated version of its popular Nike+ SportWatch. The Nike+ SportsWatch GPS special edition version of the device has all the same functionality as the original sporting wrist watch, including an LCD display, TomTom-powered GPS functionality, pace and time monitoring tools, pedometer distance tracking and heart rate monitoring info. However, it also comes blinged out with 18 carat gold decoration and glistening white framework, all stamped with the iconic Swoosh branding. The watch has already made it onto the London 2012 Olympic gold medal podium, when US sprinter Allyson Felix collected her 200m first place prize (though she unfortunately had her tracksuit sleeves pulled down over it).